These names might not be familiar to you right now, but they could help you make a lot of money. It might seem like every stock out there is either overpriced or attached to a company with a lot of problems. This is particularly true in the energy industry, as the oil and gas downturn continues to weigh heavily on producers, suppliers, and everyone in between. But in our search for worthwhile stocks, we have three companies that aren't exactly household names that could make for great investments. Our contributors think the following should be on every investor's list: Diamondback Energy Inc. (NASDAQ:FANG), a small oil driller with big potential; Core Laboratories N.V. (NYSE:CLB), a technology-focused service provider; and NOW Inc. (NYSE:DNOW), the little-known spinoff of a much bigger player. Matt DiLallo (Diamondback Energy): Permian Basin driller Diamondback Energy isn't a household name just yet. However, investors are certainly starting to take notice after it recently completed a transformational transaction to bolster its acreage position in the scorching-hot Permian Basin. That deal provides the company with a springboard for near-term production growth, putting it in position to deliver a 60% output increase this year. That said, even before completing that deal, it was on pace to achieve more than 30% production growth in 2017. That's not growth for the sake of growth, either. Drilling locations across Diamondback Energy's acreage position can achieve internal rates of return in excess of 100% in the current commodity price environment. That's why the company can deliver such an impressive growth rate while living within cash flow in current market conditions. The near-term boost is just part of the story. Diamondback Energy believes that its combined acreage position across the basin can support 15 to 20 rigs per year, which is up from the current expectation that it will run eight rigs this year. Given those projections, the company believes it has the resources that provide it with a "runway for unprecedented growth for years to come," according to CEO Travis Stice. It's a compelling platform, to say the least, which is why investors will want to start paying closer attention to Diamondback Energy. Tyler Crowe (Core Laboratories): There are so many oil and gas companies out there that work behind the scenes and don't have a presence in front of everyday consumers. One of those companies is Core Labs, an oil and gas services company that specializes in core sampling of reservoir rocks to optimize production and recovery of a particular oil formation. You might not have heard of it, but you can bet that almost every oil and gas producer out there has heard of Core. Chances are, they have used its services at one point or another. What makes Core so valuable to producers is that the services it provides improve well economics. When we're talking about an ultra-deep offshore reservoir that can take billions of dollars to develop or a shale well that has rather thin margins in a low-oil-price environment, this kind of data can be incredibly valuable in making a marginal well into a high-rate-of-return operation. It's why Core has a wide range of customers, from the giant national oil companies in the Middle East to the mom-and-pop shale producers in the U.S. today. Since Core's work is a significant value add for its clients, it has something that few oil services companies have: pricing power. That's why, despite the major downturn in oil and gas activity over the past couple of years, Core has been able to maintain decent net income margins, high free cash flow, and the best return on invested capital in the business. 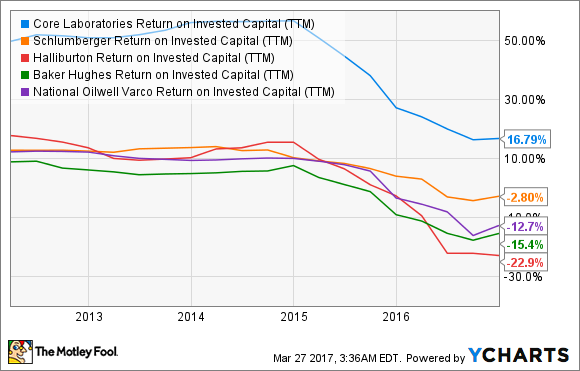 CLB Return on Invested Capital (TTM) data by YCharts. Core might not have been on your radar as an oil and gas investment. But when you consider its competitive position in the industry, its propensity to generate strong returns, and its history of giving them back to shareholders, it makes Core a stock worth watching. NOW Inc. may not ring a bell for you, but as it's one of the biggest and most important distributors of all manner of equipment, parts, and supplies for the oil and gas industry, there's a good chance the company's phone number is on speed dial at the purchasing department of almost every oil and gas company out there. And since it looks like the company's sales bottomed out in early 2016, now's an excellent time to put it on your short list. When Now Inc. reported earnings in February, sales were down from the year-ago quarter, but they were up sequentially, marking the second quarter in a row with sequential sales growth. Yes, it continues to report losses on a GAAP basis, and that shouldn't be ignored. But on a cash flow basis, the company is stronger than you'd think, having produced $49 million in cash from operations last quarter, and delivering sequential cash flow growth as revenue recovers. Nonetheless, the market continues to move away from NOW's stock, which has fallen 27% from its 2017 high even as drilling activity ramps up, something that will directly benefit NOW. 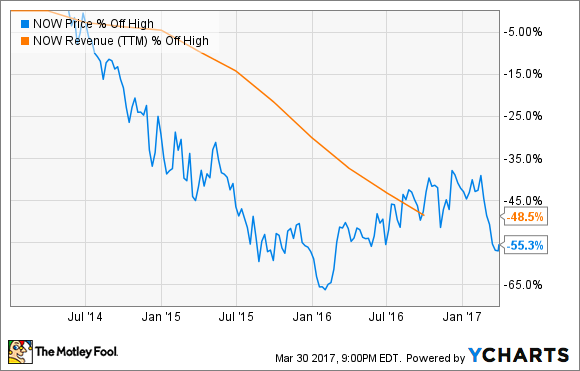 Add it all up and this little-known stock is getting ignored. You'd do well to consider snapping up shares of this important, well-run company while Mr. Market has its back turned.